What is in your duct system? It is unavoidable that over time, dust and debris will collect in your ducts, particularly in the return air ducts. Depending on the age of your home and its location, it will hold dust, dirt, pollen,animal dander and other contaminants that flow into your duct system through the cold air intake. If the duct work continues to collect debris, it could become an ideal breeding ground for bacteria, mildew, mold spores and other microbes. This can be a health issue for your family if they suffer with asthma, allergies or other respiratory ailment. 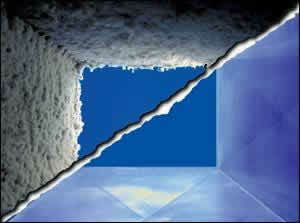 Air duct cleaning is a very important step in the restoration process. Whether you have had a fire or smoke damage, or to prevent mold growth after a flood, it is always best to make sure that your system is clean from top to bottom. New or newly renovated homes may also require air duct cleaning if the furnace has been in operation while finishing carpentry has been preformed. Drywall dust, fiberglass pieces and sawdust has the ability to travel through the air and into your system. Allergy Relief – we eliminate up to 82% of the mold, mildew, and bacteria. Dust Control – your ducts are brush vacuumed; you’ll devote less housework to dusting and vacuuming. Air Flow – a clean system means the unit works more efficiently. This equals lower utility bills. Floor registers are removed, cleaned and returned. No Mess – our process doesn’t blow the dust up in the system. Our cleaning process is clean and thorough. What should you look for in a Duct Cleaning Company? How long have they been in business or providing duct cleaning services? Are their employee’s local and professional in appearance? What does their vehicle and equipment look like? We are proud to say, we have been professionally cleaning air ducts since 1983 and have always been established in Orangeville. We do not telephone solicit, and we can give you a price, over the phone before we come out. No extra charges or hidden fee’s. Our cube van is marked with our name and number, our staff are all from the Orangeville area and come to the door in uniform with a name badge. When should I have Highland Restoration clean my air ducts?